Friday is upon us which means so downtime for our family! Tonight we are having our friends and their kids over to do Valentine’s crafts and enjoy a meal together. I’ve made the kids a simple perogie bake and we adults will be having my Spicy Chicken Chilli. 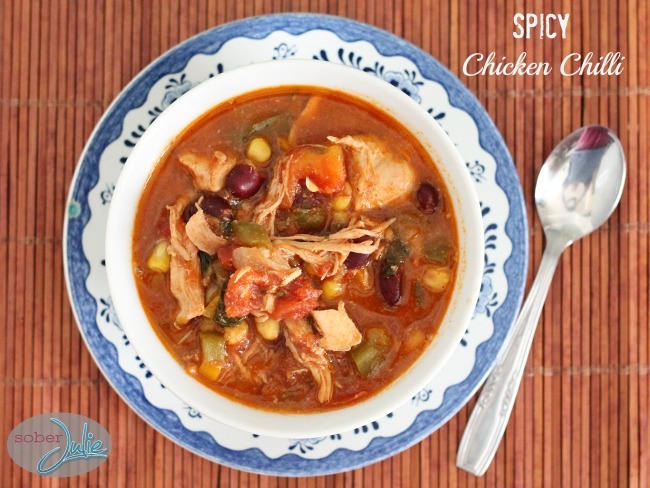 This Spicy Chicken Chilli is a favourite here, we adore jalapeños and the kick they bring. I hope you enjoy it as much as we do. Pour chicken broth into a pot and bring to a boil. Add in the chicken breasts, cover and allow to cook on medium heat for 20 minutes. Remove chicken and keep the broth. In a large pot, heat the olive oil and saute the peppers, onion, garlic and jalapeño until they are tender. Add the diced tomatoes, kidney beans, shredded chicken, cumin, chilli powder and broth. Stir, cover and simmer on low-medium heat for 1 hour. Once the hour is up, uncover, stir and add in any water if you’d prefer it runnier. Check out these other wonderful Chilli recipes: Presidential Chilli, No Bean Hawaiian Chili, White Chicken Chili, Classic Chili Con Carne, Crockpot Chili, Jalapeno Popper Chili and Crockpot Lime Chicken Chilli. Once the hour is up, uncover, stir and add in any water if you'd prefer it runnier. Ohh this sounds good! I love all the veggies and spices. Can’t wait to try it. Looks so good! I love spicy meaty chili! And how much do I love that I can see you in your spoon?! I only noticed because I see this exact same thing in my pictures…love it! It’s the first time I’ve gotten that shot and frankly I like it! I do love a chili that is spicy!! 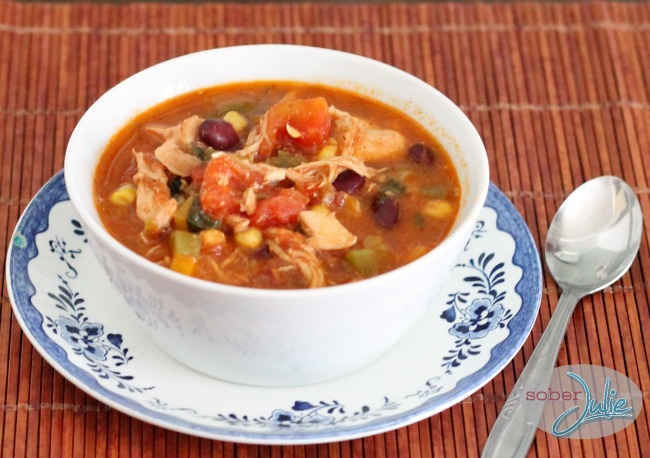 I have never had a chicken chili before – this looks so delicious! This sounds great! As does the perogie bake! Any chance you’ll be posting that recipe? I have just printed this, perfect for us this week and so healthy, too.